Atillio Banca and Bill Orr (1925-) at the Maitland Art Center in Maitland, Florida. Banca, photographed on the left, was the Gallery Director of the Research Studio and a close, personal friend of artist Jules André Smith. The painting in the photograph is a portrait of Smith. 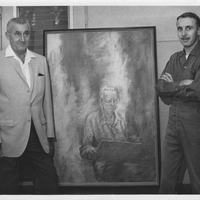 The portait was painted by Orr, who is photographed on the right. Growing up in Michigan, Orr worked breaking in mustang ponies. When World War II broke out, Orr joined the U.S. Army and was a member of the cavalry regiment. Later seeing action on Okinawa in the Pacific Theater, he was among the first servicemen to serve in Japan after the war. Orr found his way to the Research Studio in 1961 after applying for a position through a newspaper advertisement. Orr, along with Maury Hurt, was instrumental in leading the movement to save the Art Center from developers in the 1960s. As an artist he made a living doing life-size portraits of horses. He would go on to establish himself as a leading equine artist, a tribute to his lifetime love of horses. 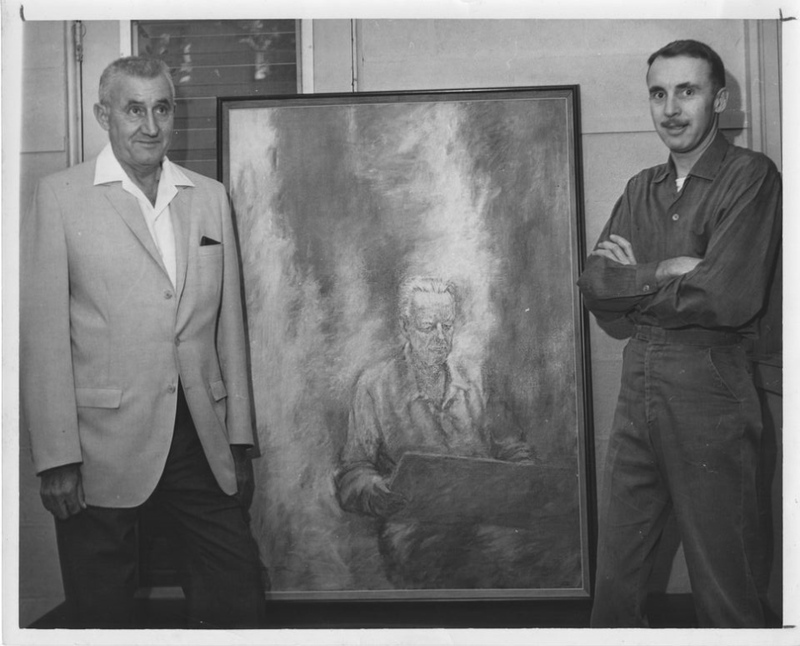 Original black and white photograph: Art & History Museums - Maitland, Maitland, Florida. Copyright to this resource is held by the Art & History Museums - Maitland and is provided here by RICHES of Central Florida for educational purposes only. “Atillio Banca and Bill Orr.” RICHES of Central Florida accessed April 18, 2019, https://richesmi.cah.ucf.edu/omeka/items/show/5341.